Also, don’t forget to check out both of Cyanide Nation Studios’ short films, “Fitting In” and “10-50”, which will be featured as part of the Puerto Rico Horror Film Fest! “Fitting In” will be part of the short film bundle “PUERTO RICO SHORTS 1”. It was written and directed by Wilfred Miranda (W. Miranda Photography) and stars Alice P. Knight and Mako Sánchez from Cyanide Nation! 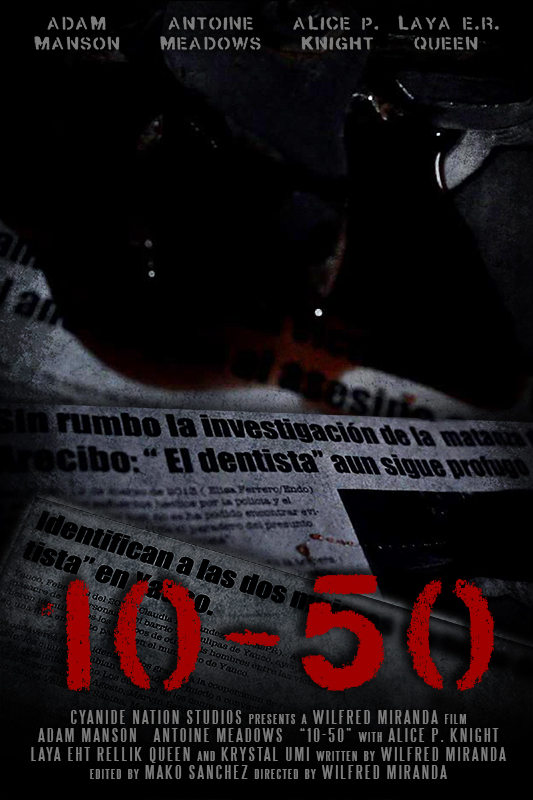 “10-50” will be part of the short film bundle “PUERTO RICO SHORTS 2”. Written and directed by Wilfred Miranda (W. Miranda Photography) starring Adam Manson, Antoine Meadows, Alice P. Knight & Krystal Umi from Cyanide Nation!